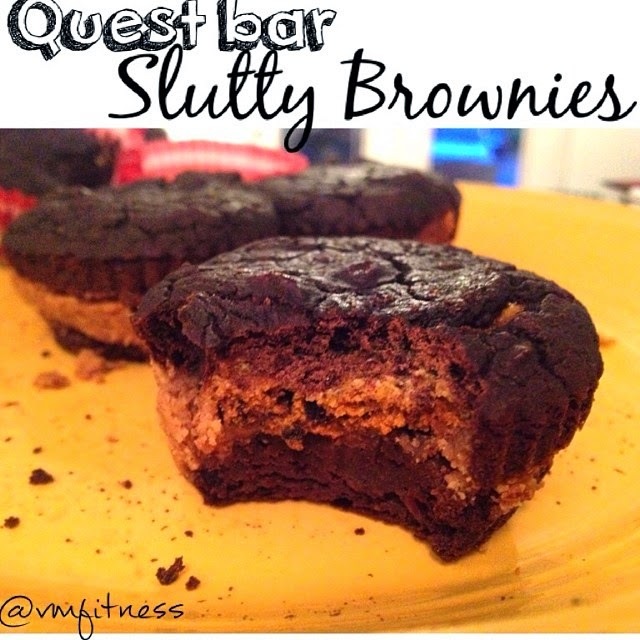 VMfitness: Gluten Free Black Bean Brownies AGAIN & Slutty Brownies with Quest Bars! Gluten Free Black Bean Brownies AGAIN & Slutty Brownies with Quest Bars! I don't even know how many different black bean brownie recipes I've made and tried, but this is by farrr my FAVORITE. It's fudgy, melt in your mouth deliciousness. To store, keep in tupperware and fridge. 1 flax egg = 1 TBS flax meal + water mixed together and put in fridge to set. 1 can rinsed and drained black beans. 1/4 cup semi sweet chocolate chips. Blend rinsed black beans with the egg, apple sauce, vanilla extract. Then mix in the honey and the rest of the ingredients. Mix in chocolate chips and flax egg last. 2 quest bar cookies & cream. Warm 2 Cookies&Cream Quest Bars in microwave for 15 seconds. Break apart each bar into 5 pieces (have 10 total!). Shape the pieces into 10 flat Circles. Set aside. Spray silicone cups with baking spray. First layer brownie base, then plop a dollop of peanut butter on top, then a Quest Bar Cookies and Cream flat round piece, then top with more brownie batter. Should make 10 slutty brownies!. Bake at 350 F for 20-25 mins or until toothpick comes clean! Let cool completely before removing from cups.